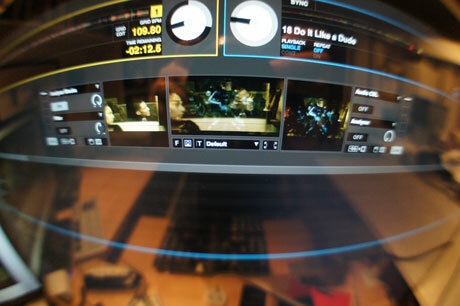 I've been lucky enough to get an early build of Serato Video and have been running it a little with a Novation Twitch. I'm sure it runs with my VCI-300 too, but I'm keen to exploit the more control surface rather than DJ way of using video. As so far, it's run very smoothly, and the slicer works like a charm, as do all 8 cue points. I'm not familiar with Video-SL that this replaces. I was promised a review that never materialised, so I'll be throwing myself into it noob style to see what all the fuss is about once it drops properly. I can however report that it's heaps of fun. But what you see in these pictures is subject to change, as are the features. More than that I'm forbidden by international law to say. I'll probably get into strife for posting these images. Just out of interest, do you see Jesse J or Q-Tip first? I see Q-Tip. ...but to my horror i realized that my V7 decks (obviously) don't feature a mixer section and Itch won't allow use of ANY 3rd party MIDI devices. so i can only expect limited (at best) control over video cueing.. i'm sure they'll assign button on the V7 to do transitions, but even still we're talking about an extremly limited experience. oh well, my loss. at least I can use my Zero4 with Scratch Live... but for now i've been keeping a DJ2GO over my 07 while i'm getting familiar with it. so... have they said if this will be available starting March 1st? Is there much difference between serato video and video sl? To be fair serato better buck up there idea's, they hardly showed any interest in this product. I felt they should have offered free videos to download, or at least had some sort of page similar to whitelable.Where artist could promote video's textures to the masses..blah blah.. If it's being demo'd in the video on an old polycarbonate Macbook. 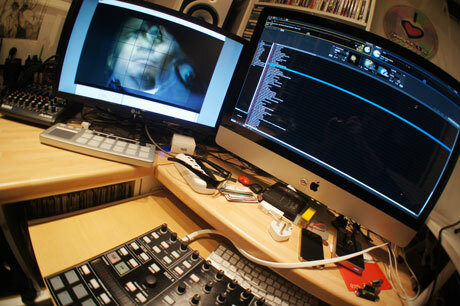 does that suggest that Serato video will work on a fairly modest machine? I always understood you needed at least a 15" MacBook Pro with the seperate video card & that 13" Pro's or old MacBooks wouldn't be up to it. Serato has confirmed on their forum that there aren't any new features in Serato Video that Video SL didn't already have. They're stressing that it was a complete rebuild, and that performance and updates will be much easier to manage now. We'll see. Their track record on the video side has been uncharacteristically sad. And at this point, they have to open up external MIDI support for Itch. Enough already with that sad little distinction between it and Scratch Live. Prevolt, unfortunately they can't open up Itch until they start charging for it. Since the software is free the only money they make is on licensing with hardware. I think this will happen in the near future with Serato Intro being basically a LE version which could be the free software bundled now. March is around the corner.....This must be in heavy testing right now. What I would love to see would be a license you can buy, maybe with a kit so they can tie it to hardware sales, that would allow you to feed data from crossfader and upfaders from popular mixers to make a pair of v7's useable with serato video. I love using my innofader equipped 07pro with my v7's as a portable rig. I would easily pay $100 or maybe more for a board that reads fader state and feeds it into itch to trigger transitions and such. If any manufacturers are reading, Elliot, make a mixer with the form factor like the 05pro or nuo2.0, but with official itch support and controls. And innofader compatible. MIDI is coming to ITCH, they have already said it. "Prevolt, unfortunately they can't open up Itch until they start charging for it."